Welcome to the first of two Stampin' Up! 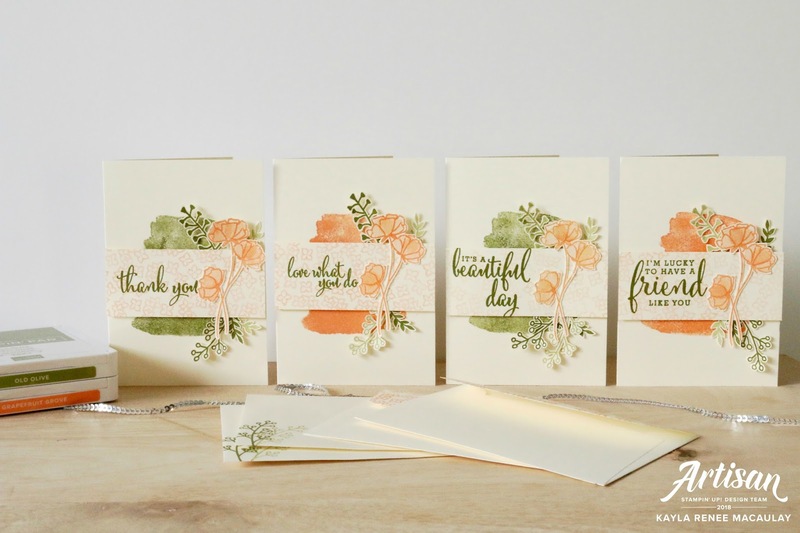 Artisan Design Team blog hops featuring the brand new Share What You Love bundle of products. 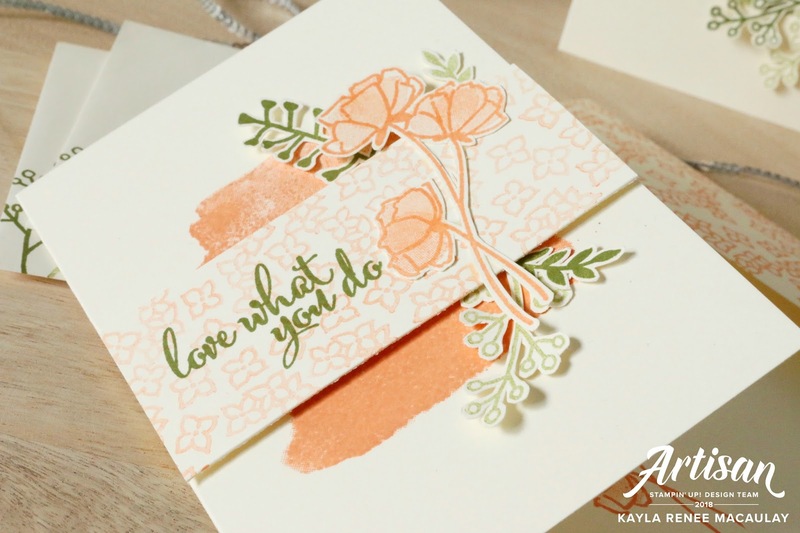 The Share What You Love promotion has been created by Stampin' Up! 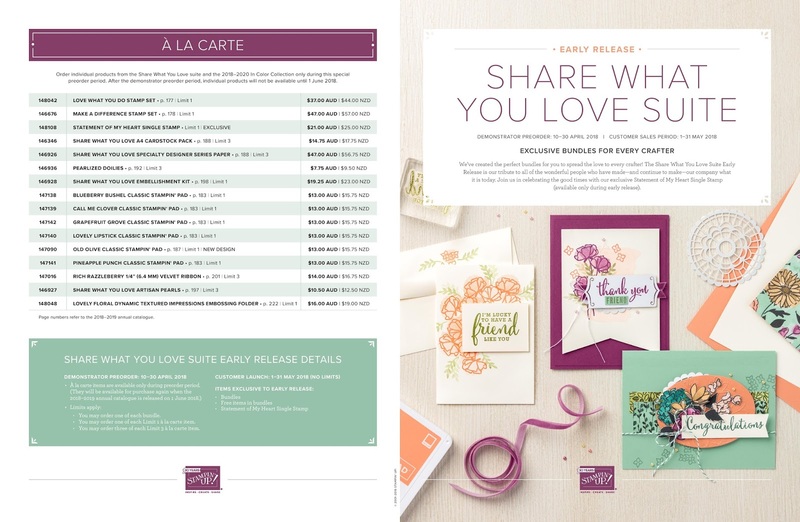 as a special early release of brand new Annual Catalogue products that are designed to celebrate all the crafters that have helped make the company what it is today, and that is a place for creativity, friendship and all the amazing connections we make sharing and doing what we love every day. These new bundles are available to order by demonstrators now so it is a great reason to join Stampin' Up! and take advantage of this amazing offer and all the gorgeous products and great company that you can be part of. These products will also be orderable as a customer but only from May 1st through to May 31st. The other exciting thing about this release is that Stampin' Up! are offering special limited edition bundles with the opportunity to earn FREE products when you order as a bundle. There are three bundles available; Just Getting Started Bundle, A Little More, Please Bundle and finally the Gotta Have It All Bundle. 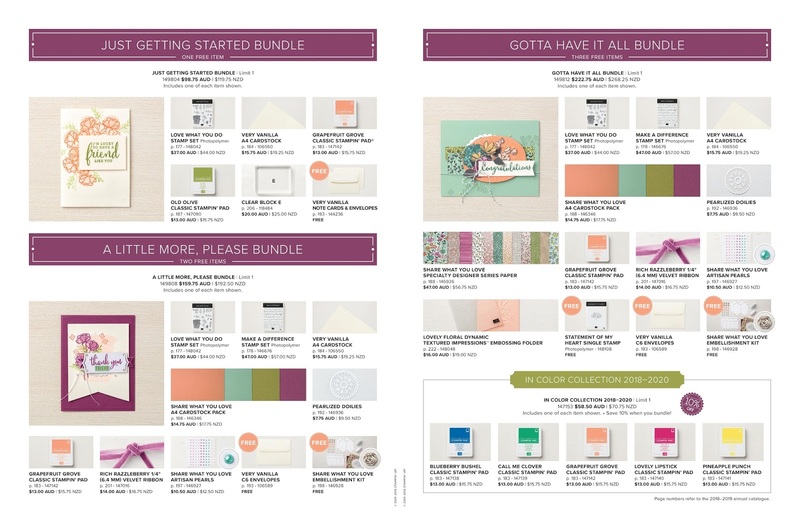 There is a bundle with each kind of crafter in mind! Also during this period it gives you the chance to order the brand new 2018-2020 In Colour Ink Pad collections featuring our brand new Ink Pad case design! In addition to these amazing bundles there is also an option to order all these products A la Carte during the pre-order period so you can get extras of all the lovely embellishments and extras if you wish. There is also an amazing Statement of The Heart stamp set which as a demonstrator I think would be amazing to create welcoming cards for new team members or customers! You can see our statement of the heart at the end of this blog post. Here's a look at what I have created using just the products from the Just Getting Started Bundle. I created these cards with simplicity and ease in mind, aimed at the brand new crafter that may have minimal supplies and is just starting out with card making. 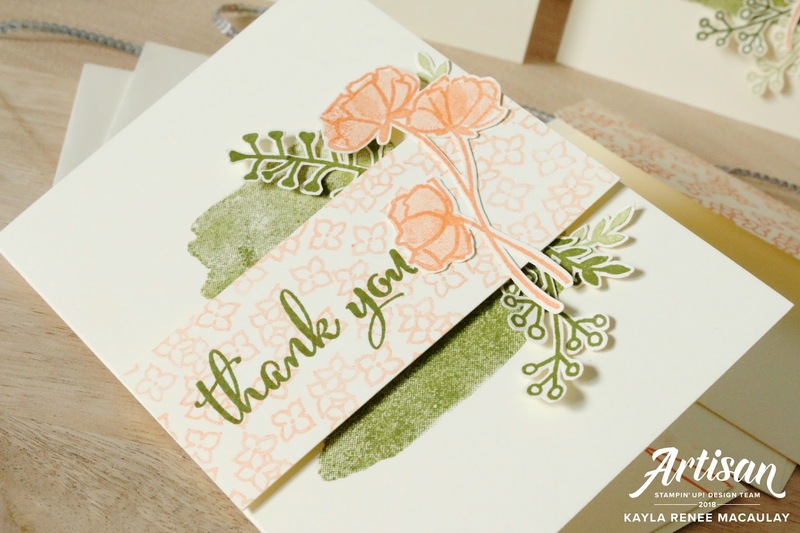 With a few basic supplies such as Very Vanilla Notecards & Envelopes, a couple of ink colours (in this case Old Olive and Grapefruit Grove) and a stamp set you can create these great easy to make cards. How easy and fun would this be for a beginners class to show them the possibilities of what they can create with very minimal supplies? 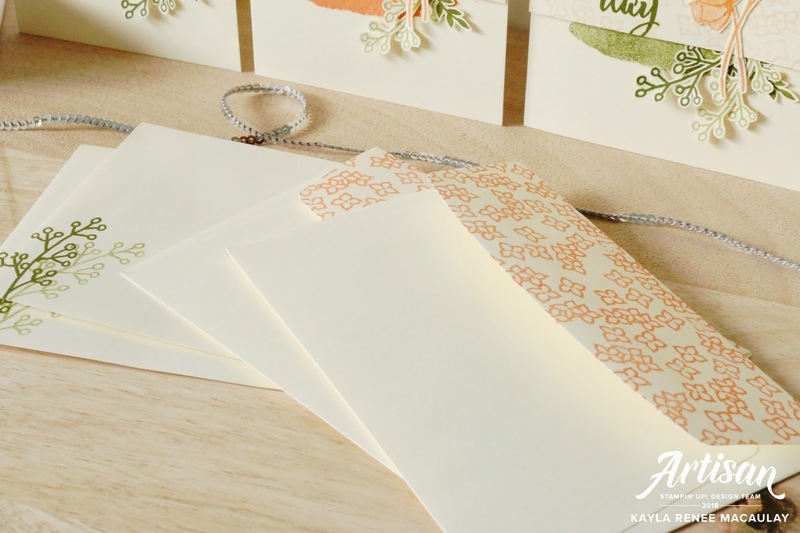 To make the class even more engaging and fun I have also decorated the coordinating Very Vanilla Envelopes with the coordinating stamp sets using a bit of repetitive stamping and a bit of stamping off and repeat stamping. I love the fun and finished look it gives this set of cards. Here's a close up of the initial card that I made. I begun by stamping out all my flowers, leaves and florals with both the Grapefruit Grove and Old Olive Ink Pads on some Very Vanilla Thick A4 Cardstock and spent a little bit fussy cutting around all my images. 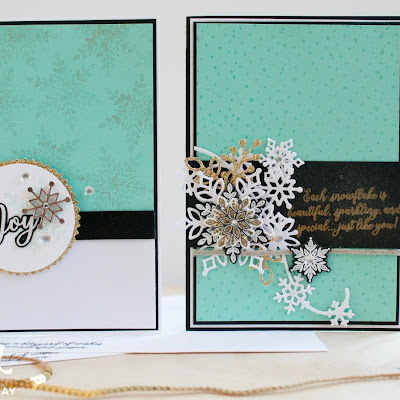 This gave me some easy and fun layering and embellishments to work with. I have created a strip to stamp my sentiment on that is roughly 2'' in width and spans across the length of the card. I have done some stamped off background stamping using one of the floral images. The second card I made I used the same layout and techniques but just changed up a few of the colours. I have stamped all my sentiments in Old Olive and used a mixture of Old Olive and Grapefruit Grove stamped off with the watercolour image straight on the background of the card. This would also look great inked up and lightly misted with water using a Stampin' Spritzer for more of a watercoloured look. The final two cards I made are shown below. I love that the layout and style were the same but I have mixed it up a little and changed a few things I have done on each card. This set of cards gives the customer and opportunity to use most of the stamp sets included in the Love What You Do Stamp Set. I know myself that I always feel somewhat accomplished if I can use all the images in a stamp set. If you love this promotion and these bundles as much as I do, it's important to get them now as these special promotion only bundles and prices will not be available in the 2018-2019 Annual Catalogue and are only available as a special pre-order only price, with freebies! If you are a demonstrator you can find these exclusive, early release bundles available now in your back office for a limited time only! Contact your local demonstrator or contact me if you don't have a demonstrator and live in Australia if you would like more information on how to order one of these bundles for yourself. Here's a look at the Statement of the Heart which encompasses everything I just love about this company. This also provides you with a sneak peek of the special and exclusive pre-order only exclusive Statement of The Heart Stamp Set. 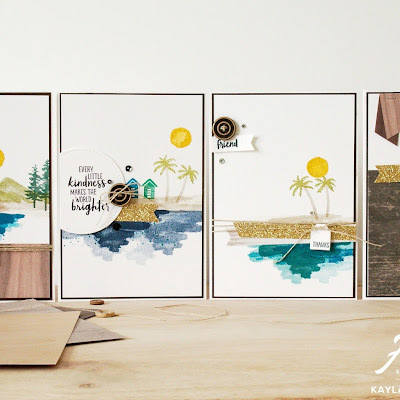 To see more amazing projects hop along to the next blog by the lovely Kim McGillis’s Blog to see what she has done using the Share What You Love products. To see all the details of this amazing promotion you can find all the details below. I hope that you have enjoyed looking at these new bundles and the cards that I have created using very minimal but well coordinated supplies. 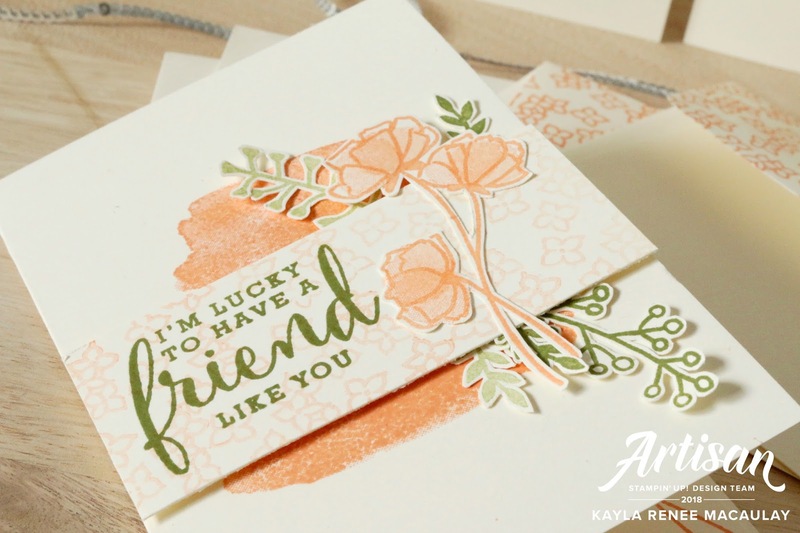 They would be perfect for beginners and perfect for an easy workshop and a great opening to talk about all the things you love about Stampin' Up! Let's all share what we love! 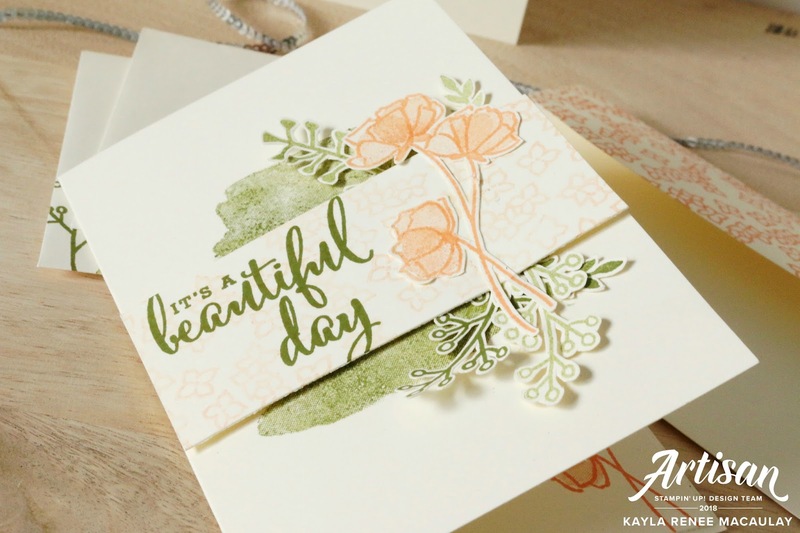 Kayla, your cards are simply beautiful and great for new stampers. Oh Kayla, the cards are sooo beautiful!!! 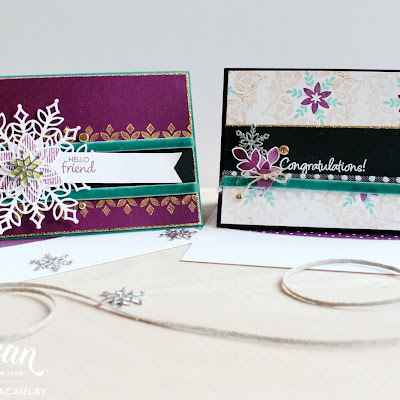 Kayla, these cards are so, so pretty and I love how you employed the same template for each one. These are gorgeous Kayla! Love how you used the ink spot and all the flower details! Amazing! These are gorgeous Kayla! Such perfect details! You made simple look AMAZING my friend. Well done!!!! Oh I just adore these cards. All the layers and cut details are exquisite! Gorgeous set of notecards Kayla! Your cards are so clever! Thanks for sharing! I never thought, somebody could do such beautiful things with a limited amount of stuff! Great! Onstage Sydney April 2018 ~ NEW PRODUCTS!